Protection for you, protection for your kids! Save £24 on the single can price when you purchase this bundle of 4. Only whilst stocks last! 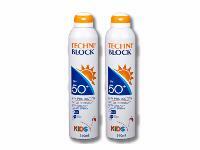 , dries instantly on the skin to provide an invisible UV barrier and contains photo-stabilisers to boost performance. Highly resistant to water and perspiration, it's great for kids and adults alike, offering high protection for sensitive skin. Protection is delivered in a clean, cooling, continuous aerosol spray that works upside down and provides simple and effortless all over application - even on the scalp! It contains anti-oxidants to enhance the skin's natural defences in the fight against the damaging and ageing effects of UV exposure. Fragrance-free and breathable, Techniblock will not block pores or irritate even the most sensitive skin, significantly reducing or even eradicating the symptoms of skin rash and prickly heat. A single application can last all day without the need to constantly re-apply, providing great value for money. The absence of oils and emulsifiers in the formula means it will not block pores or break down in water. Techniblock has no expiry date because it's an aerosol and is packaged in a sealed and pressurised airtight container, meaning no waste and no risk of spillage in the bottom of your beach bag! 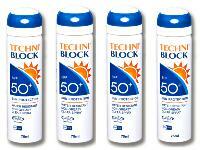 Developed and manufactured to the highest standards by Technikon Pharmaceutical Laboratories in South Africa, Techniblock provides broad spectrum (UVA/UVB) protection more than equivalent to the Boots 5 star rating system. It is compliant with legislation on sunscreens and has been rigorously tested. It carries the CANSA seal of approval and SunSmart Choice seal so you can be assured of complete protection for you and your family.